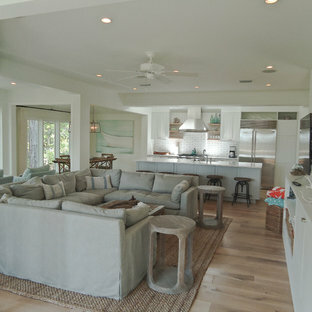 Photo of a small beach style formal open concept living room in Milwaukee with beige walls, dark hardwood floors, no fireplace, no tv and brown floor. 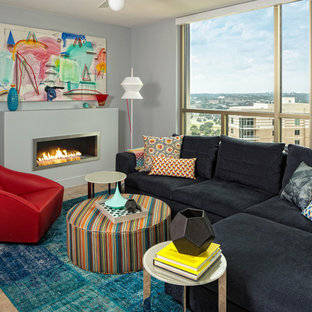 This is an example of a small contemporary open concept living room in Austin with grey walls, a ribbon fireplace, linoleum floors, a metal fireplace surround and no tv. 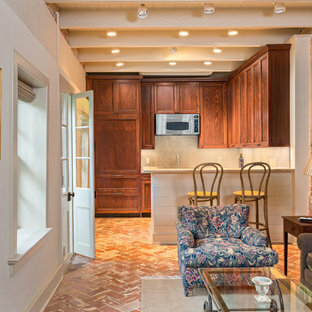 Design ideas for a small traditional open concept living room in New Orleans with brick floors. 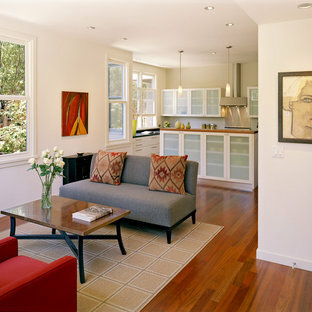 Photo of a small contemporary open concept living room in San Francisco with white walls, no fireplace and no tv. 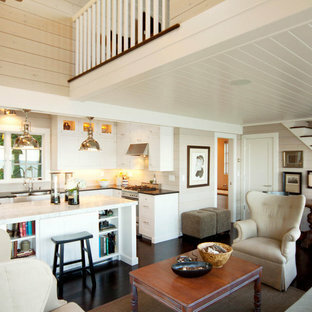 Inspiration for a small contemporary open concept family room in Los Angeles with white walls, no tv and carpet. We tried to recycle as much as we could. The floorboards were from an old mill in yorkshire, rough sawn and then waxed white. 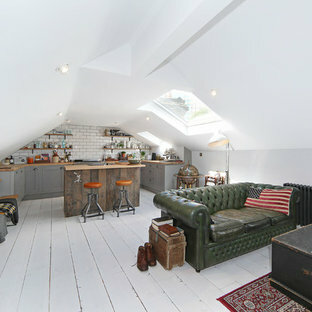 Most of the furniture is from a range of Vintage shops around Hackney and flea markets. The island is wrapped in the old floorboards as well as the kitchen shelves. 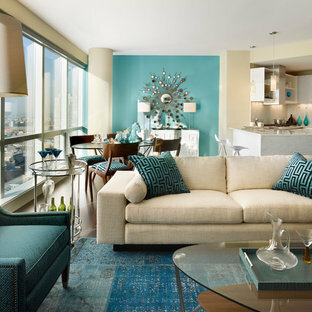 Inspiration for a small contemporary open concept living room in New York with blue walls. Hidden pocket doors create an open connection to a private outdoor terrace. Photo of a small contemporary open concept living room in Los Angeles with white walls, dark hardwood floors and a library. Small contemporary formal open concept living room in Berlin with white walls, medium hardwood floors and no fireplace. Small modern open concept living room in Seattle. By moving four walls and replacing them with a column and four beams a new open living area was created. This is an example of a small modern open concept living room in Los Angeles with a library, white walls, dark hardwood floors and brown floor. By Stage Right Design, Inc.
Inspiration for a small transitional formal open concept living room in Sacramento with white walls and a wall-mounted tv. Open plan apartment An entire apartment captured in one photo. Smart space design and beautiful interior design come together to maximise every inch of this luxury space. Double height kitchen; elegant sitting room; built in home office under a cantilevered staircase; glass floor mezzanine which houses the master bedroom and ensuite with mirrored wardrobes at the end. Inspiration for a small traditional formal open concept living room in Other with yellow walls, carpet, no fireplace, no tv and beige floor. Inspiration for a small contemporary open concept living room in Austin with grey walls, linoleum floors, a ribbon fireplace, a metal fireplace surround and no tv. 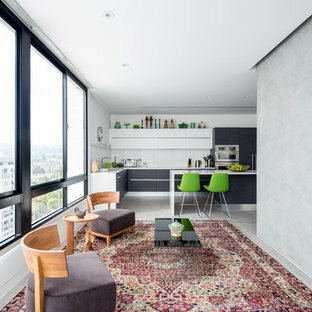 Small modern open concept family room in Brisbane with beige walls, ceramic floors, no fireplace, a wall-mounted tv and grey floor.